The Eat And Ride session proved to be a delectable appetiser ahead of The Straits Times Run for some 18 participants. They got a taste of various foods and what it takes to prepare for the Sept 23 main course at the Singapore Sports Hub in the first of the build-up activities for this year's ST Run. 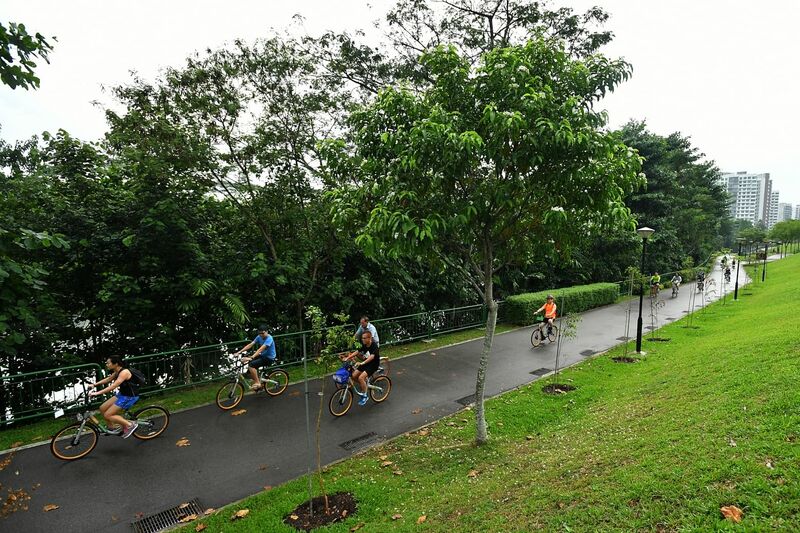 The afternoon drizzle yesterday did little to dampen the spirits of the running enthusiasts, who were joined by 11 other riders during the 19km cafe bike trail in the north-east of Singapore. They tackled the route - featuring three cafe pit stops - at a leisurely pace. Chef Gary Lim, who was cycling for the first time in five years, said cycling in the rain was a fun experience. "You don't feel the heat of the sun and the weather is cool," said the 35-year-old, who will participate in the 5km category of the ST Run. His wife Sherlyn Lee, who will run in the 18.45km category, agreed. The 38-year-old added: "Because it was drizzling, there were also fewer people in the park, which made it easier to cycle." Starting from Punggol Park, the cyclists rode 3km along the Punggol Waterway area on bicycles provided by oBike, before stopping at Seoul Good cafe at Punggol East for Korean fried chicken wings and iced tea. They then made their way to Punggol Settlement for chendol, courtesy of Inspirit House. The trail ended at The Summerhouse at Seletar Aerospace Park. For engineering executive Desmond Lee, who participated in the Eat and Ride event with his twin brother Ivan and their friend Lee Jia Hao, a highlight of the session was discovering parts of Singapore that he usually does not visit. Said Desmond, 27: "The places along the route today are those where I normally wouldn't plan to go because it's quite far from where I stay." Ivan noted that their weekend cycling jaunts usually take them from their home in Tampines to Pasir Ris Park. The youth worker added: "What interested me about this year's ST Run were the pre-run events, which will help runners prepare for the race. Today's event was very well-organised and had good support - a lead cyclist, a sweeper and a medic guided us during the ride." The brothers are participating in their third ST Run together, and roped in Jia Hao for this edition. The latter, who is set to take part in his first ST Run, hailed the Eat And Ride session as "very well-planned with no hiccups". While the food was one of the highlights of his ride, what he enjoyed most was cycling with his friends. Said the public servant: "The last stretch (which lasted about 10km) was a bit tiring, but it was fun." The next build-up activity for the sixth ST Run is a Bounce Fit trampoline session on May 5, which Jia Hao intends to sign up for. A range of fitness and lifestyle activities geared towards getting participants ready for the run have been planned. These include a CrossFit session at Innervate Fitness on June 17 and a cardio three-way session at TripleFit on July 22. Visit www.straitstimesrun.com to register for these events in the Pre-run Activities & Workshops section under the Race Info tab.